The hotels, their location, special offers, event schedule, trains and aeroplane schedules regularly updated. New service: Transfer A/R Cortina d'Ampezzo - Aeroporto di Venezia. Live images of the nicest areas of Cortina. All you need to know for a great snow vacation. Ski schools, ski teachers, events, ski-rentals and other winter sports. Weather and avalanche forecast bulletin center information. 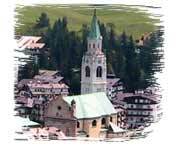 All events of Cortina and close areas. Great images, studies, information, great links from one of the highest astronomical observatories in Europe. Parking places, one way, streets.Some suggestion to use better Your car. You can hear Radio Cortina with Real Audio.